Suncoast Reef Rover divers said the snook were so thick along the North Jetty that they literally had to brush them aside to conduct their underwater cleanup on Sunday, May 20, 2018. It was a beautiful morning for everyone involved, a total of 41 volunteers, 20 divers, 3 paddlers, and 16 “topsider” support. It’s so much fun to get together with good people and spend a little time making one of our favorite places better for fish, wildlife and people too. Ken Lackmann got everybody organized. Ronda Ryan and Susie got filthy measuring and weighing all the crazy things that were pulled up. 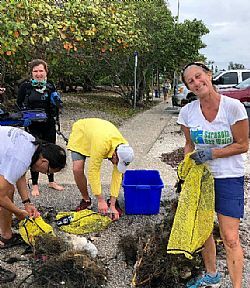 This underwater cleanup was a friendly collaboration among the Suncoast Reef Rovers of Venice, Sarasota Bay Watch, Reelcycle and the Sarasota County Sheriff’s Office.